Commercial real estate investing in Houston is rewarding for investors like you. However, there are also mistakes that you can make when investing in Houston commercial real estate. Below are 7 deadly sins commercial real estate investors make and some suggestions for avoiding them. If you’re the type of person who enjoys a good challenge, you might be tempted to try commercial real estate investing totally on your own. Yet at the same time, if you have little or no experience in commercial real estate, this may not be the wisest choice. If you go it alone, you’re taking a huge burden on yourself to purchase, own, and operate a property. Very few people dream of failing at the things they try. Yet the prospect of failing at commercial real estate is real. On top of that, it can be expensive. If you’ve never bought and owned commercial real estate before, you need pros to guide you through the buying process. And you need experienced people to help you to manage the property once you are the owner. Instead of investing alone, surround yourself with professionals, like CXRE’s team of experts, who have experience and who can offer valuable advice during every phase. So do yourself a huge favor by getting expert advice before diving headfirst into commercial real estate investing in Houston. No matter how great a property looks on paper or even in person, taking it at face value is not enough when investing in Houston commercial real estate. There are so many things that a commercial real estate investor needs to know about a property. Doing your due diligence not only prepares your expectations for the actual purchase, but it also prepares you for owning and managing the property. So what are some things you should ask for and know? You should request detailed, verified financial reports that have been CPA-audited or CPA- prepared. On top of that, you should ask for previous tax returns and make sure to review each executed lease, all the options, and any amendments. On top of that, be sure to request previous third-party reports including appraisals, surveys, environmental engineering reports, and structural engineering reports. This will help you to discover any problems with the property. Failing to learn about these and other things could mean you pay more than the property is worth. And down the road, not knowing certain things could make owning and managing the property more difficult. So instead of being surprised by unexpected issues, do your due diligence up front for commercial real estate investing in Houston. After all, how can you make a realistic offer on a property without knowing as much as you can about it? And how do you expect to manage it without knowing what you’ve bought? Caveat emptor is Latin for “Let the buyer beware”. This a common warning offered to buyers of real estate. The assumption is that the buyer takes full responsibility for the property they purchase. If the property doesn’t meet the buyer’s prior expectations, they’re the only one who is responsible. So following closely on the heels of doing your due diligence, you should also be prepared for surprises. Plainly put, once you sign the papers and take possession of a property, it’s yours. The returns and the rewards are yours, but so are any issues and problems. As the adage goes, ‘expect for the unexpected’. 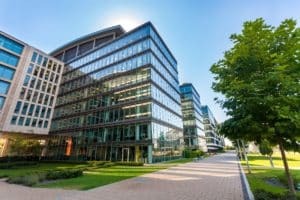 Although it is impossible to prepare for every single scenario, before purchasing and owning commercial property, learn about what you should expect. CXRE’s team of expert and professionals can help you plan for certain eventualities and troubleshoot them as they occur. In general, when investing in Houston commercial real estate do your homework. Review some worst-case scenarios and do your best to be prepared for whatever might happen. And make sure you have money saved to cover these scenarios, both now and in the years to come. Ever hear anyone say, ‘don’t put all your eggs in one basket’? That adage certainly applies to commercial real estate investing in Houston. So on top of investing with others, doing your due diligence, and being prepared for surprises, diversifying your portfolio can help to minimize your risk. If you only own office properties, retail facilities, medical office space, multifamily properties, or industrial properties, then a downturn in any of those sectors will directly affect your Houston real estate investing. For example, if you invest in a variety of properties, you won’t be as affected if the market experiences a low point in only one sector. Additionally, another way of diversifying is to purchase properties in various areas. So instead of only investing in one area of Houston, or even one part of Texas, branch out into other locations. Although this can be difficult for some investors, geographic diversification is a great idea for increasing diversity in your portfolio and limiting your risk. Awareness of the local commercial real estate market is essential for commercial real estate investing in Houston. At the same time, being unfamiliar with the local market can lead to investing mistakes. Yet you need to know much more than submarkets and neighborhoods. As an investor, you should know about things like zoning regulations, price-per-square-foot comparisons, cap rates, commercial construction activity, and economic growth in the area where you’re investing. To learn more about areas where you’d like to invest, contact CXRE today. Once you’ve purchased a property, the focus then shifts to managing and maintaining it. As tempting as it might be to handle property management by yourself, be aware that it is a task requiring a significant amount of your time and energy. There is a host of administrative details that you need to stay on top of such as maintenance, budgeting, and interacting with tenants. Doing all of this on your own can be daunting. In the end, not finding quality property management increases the difficulty of Houston real estate investing. So what does a property management company do? Some jobs include finding tenants, leasing space in the property, handling rents, and many other logistical and administrative tasks. Without a doubt, CXRE can advise you on properties to purchase and guide you through the buying process. In addition, we also offer a full range of property management services. Over the years, we have established a verified track record of expertise in property management. Not only that, but we can also handle properties and portfolios of any size. One of the main goals of commercial real investing (if not the main goal) is securing a favorable return. Yet as you do your due diligence, consider which properties to buy, think about where to buy them, and decide on a property management solution, it is wise to look past the returns. Overall, investing in commercial real estate is not a get-rich-quick prospect. In contrast, it is a long-term investment of finances, time, energy, and effort. If you fixate too much on the returns on a property, you might be tempted to assume too much debt. However, since investing is a process, there is an entire range of things you must consider, several of which are listed above. One of the best ways to stay grounded is to follow the previous steps. Doing your due diligence, educating yourself on the local commercial real estate market, and working with a great team will help you from being blinded by the dream of big returns. In the end, making money is good. At the same time, being smart about how you make your money is even better. Don’t Commit the 7 Deadly Sins! Commercial real estate investing involves risk. Yet there are steps you can take to reduce your personal risk. By CXRE’s advice, you can keep yourself from these 7 Deadly Sins. So follow our advice to maximize your commercial real estate investing in Houston! Contact the CXRE team today to get more information commercial properties in Houston.